My birthday approaches in two weeks. I’ve always loved birthdays. What extrovert doesn’t love a day of celebration? Yet, the last five birthdays haven’t been exactly joyful. On my birthday in 2013, my mother was hospitalized for pneumonia halfway across the country. I called to check on her and she forgot it was my birthday. I felt resentful and planned to tell her all about it the following day. I look back now and recognize I wanted to sit in my resentfulness; here was yet another reason she’d not quite hit the mark as a mother. My mother and I had a complicated relationship. Mental illness, addiction, and abuse all created deep crevices between us. Yet, we’d come to an unspoken agreement two years prior. Just be mother and daughter trying to salvage the relationship we had. The day after my birthday, standing in JoAnn’s fabric with an armload of sewing materials while trying to corral my then two and three-year-old daughters, my uncle called with one of the worst phone calls of my life. I sank to my knees and guttural sounds escaped my mouth while I let go of all the things in my arms. I no longer had a mother. And I have carried shame for the past five years that one of the first thoughts I had was, “She forgot my birthday.” When discussing my mother’s death, one of the first things I’d say to people over the past years was, “She died one day after my birthday and didn’t even remember to say happy birthday to me.” So self-absorbed, I sank into a depression and a woe-is-me state of mind. 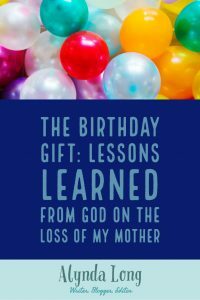 What kind of mother forgets her only child’s birthday? Of course, that’s how it was. Resentfulness, selfishness, self-pity etched itself on my heart and I added it to the pile of items that labeled me a victim. Yet, the Lord has changed my heart over past three years. He’s slowly and lovingly and sometimes painfully pulled scales from my eyes regarding my childhood, my marriage, my own choices as a mother, and my relationship with my mother. Yes, she was imperfect. We all are. She was broken, hurting, and ill prepared for motherhood. Yet, I believe she loved me in the best way she could. Last night, the Lord gave me a new way of seeing it. Instead of feeling hurt about her forgetting my birthday, He reminded me I received a gift. I heard my mother’s voice, for the last time, on my birthday. I can remember for the rest of my days, as my birthday approaches, the sound of my mother’s voice on that day. Last night, through my tears of imagining my mother in her hospital bed during her final moments, the Lord showed me the gift I’d received on that birthday five years ago. I’d received the gift of her voice. 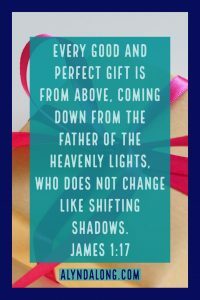 Thank you, Lord, for all your good and perfect gifts. Thank you for taking my mother to be with you where her broken pieces have been fully restored. Thank you for healing her hurts and giving her a glorious life of eternity with you. Until I see you again, Mom, I love you. Thank you so much, Connie! Praying the same for you! Awww, thank you so much, Diane! You were on my heart the other day! I pray things are going well for you. It’s been quite the journey to get to a place of healing. It definitely hasn’t happened over night, but when we let the Lord work in our lives, nothing is impossible! Life is certainly a process of letting go and letting God have all the pieces of our heart. Things are going well. Let’s connect via email soon. Alynda. Thank you for touching my heart with your story. My relationship with my father has been complicated by his drinking. My mother has always been depressed and self-absorbed. But as I’ve gotten older, I have just released my expectations of them. I also have let go of needing to be the perfect daughter. It has lightened the tension off of our relationship somewhat. Your story reminds me it is the little things that count. Bless you. Thank you so much for sharing, Dawn! Yes, the little things become big when we don’t have them any more. Unfortunately I haven’t been able to maintain a relationship with my father, but I’m thankful for what my mom and I were able to have. Blessings to you! Alynda, happy belated birthday. So 5 years for you since your mother’s passing. I am so sorry. This December ( a week to the day before Christmas) is 6 years for me. However, because of my dad, I was not allowed to see her but one time before she passed actually I was cut off from having contact in 2010; she passed in 2012. My thoughts are with you. Thank you so much, Leigha. I really believe the complicated relationships are so difficult to grieve. All those layers of pain. Praying for you as you enter the season. Blessings to you!